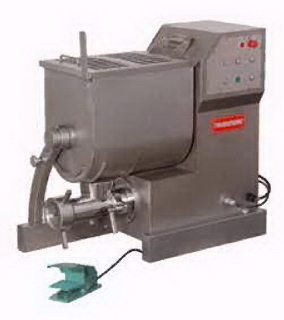 Meat mixers, or often called food mixers are very handy for mixing all sorts of foods. They can be good for mixing meat, seasonings, coleslaw, potato salad or anything you need to mix in large quantities. These machines are a great and effective way to thoroughly mix all your seasonings into whatever you are mixing. 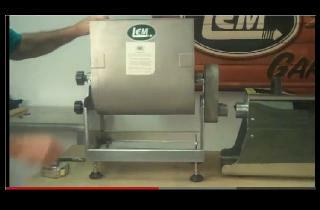 This # 32 meat grinder / mixer is perfect for heavy duty meat prep! It is stainless steel and has an 80 lb. meat capacity. You can run the mixer or just the grinder, two seperate switches. 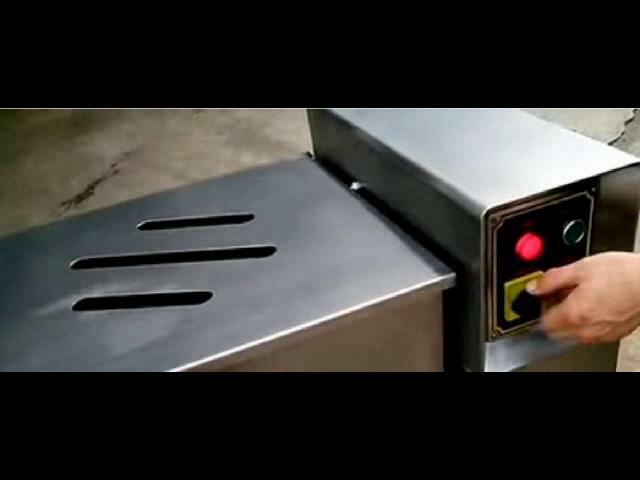 If both switches are on, the mixer will feed to the grinder. You can save on shipping charges if you have your equipment sent to a business that has a forklift or loading dock!Please check box if you do not have a business address or loading dock or forklift. 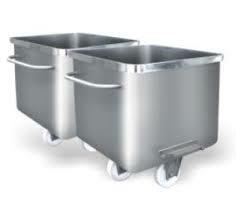 Tilts, Safety switch in lid, Casters, Stainless steel construction, Removable stainless steel paddles for easy cleaning. 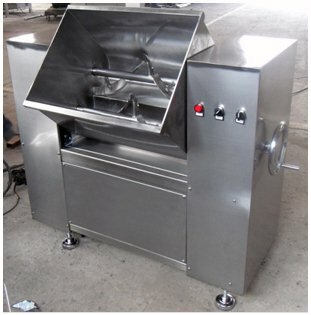 This food mixer is a food-processing machine specially designed for processing various chopped or ground food such as sausage meat or potatoes or cole slaw . It has two pairs of paddles that rotate and reverse to ensure uniform blending .All the parts contacting the food directly are made of stainless steel or are specially plated to meet the national hygiene standard. 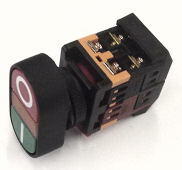 The product is ideal for commercial use. Chain-driven for sure mixing! Full One Year Parts Warranty. 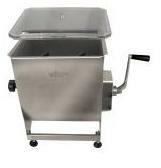 Dimensions: 32" x 20' x 43"
Tilts, Safety switch in lid, Casters, Stainless steel construction, Removable stainless steel paddles for easy cleaning. 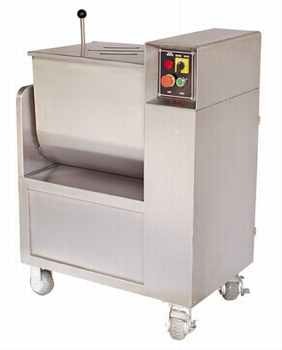 2 HP Motor:This food mixer is a food-processing machine specially designed for processing various chopped or ground food such as sausage meat or potatoes or cole slaw . 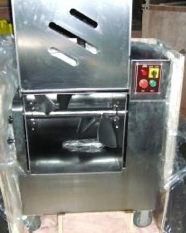 It has two pairs of blender paddles that rotate and reverse to ensure uniform blending .All the parts contacting the food directly are made of stainless steel or are specially plated to meet the national hygiene standard. The product is ideal for commercial use.40" x 20" x 42" Net Weight 480 lbs. Chain-driven for sure mixing! Full One Year Parts Warranty. Dimensions: 39" x 22' x 43"
We have been having requests for some time about this machine. 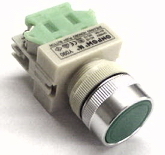 3 Phase 220V. Good for big jobs. Ideal for blending products that need to be mixed thouroughly and quickly than can be accomplished with a single paddle system. The tip-up tank and removeable blades of the stainless steel mixers are highly practical and easy to clean ensuring utmost hygiene and operator safety at all times. A little more expensive but will save time and money in the long run. You can save on shipping charges if you have your equipment sent to a business that has a forklift or loading dock! BIG!! 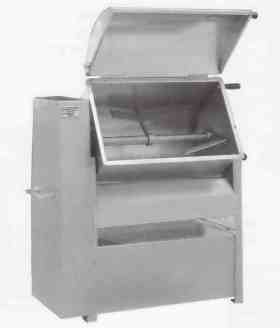 Tilts, Safety switch in lid, Casters, Stainless steel construction, Removable stainless steel paddles for easy cleaning. 2 HP Motor: 43" x 26" x 44" Great for mixing huge amounts of sausage meat or other foods - or other items that need thorough mixing. Chain-driven for sure mixing! Full One Year Parts Warranty. Be sure and check your bearing sizes. For item #646319 and others. 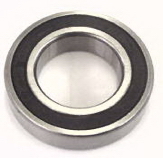 Item#(646319) uses 2 bearings. Use with Item#646319 & Item#646332. Picture shows 2 Bushings to see front and back, the price is for 1 Bushing. 100 lb Capacity. This all stainless steel mixer is ideal for mixing spices and seasonings in sausage before final grinding and stuffing. 36" X 16" X 38" Saftey bowl cover cuts power when raised or tilted. 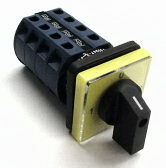 Pulse switch activates mixer when tilted for ease of unloading 1 HP, 110 Volts, 290 lbs Shipping Wt. Easily mix meat & seasonings for burgers, sausage, or jerky. Fits weston electric meat grinders for hands free mixing Sturdy, aluminum crank handle. Clear plastic cover with convenient spice slot. 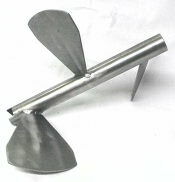 Removable, stainless steel mixing paddles. 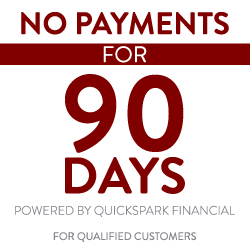 Limited one-year manufacturer’s warranty. This product makes clean up and storage so much easier! The tub can tilt 90 degrees or 180 degrees to empty or store meat. Meat tub is fully removable just flip up latch. Gearbox is water tight and includes steel roller bearings. Swivel feet adjust to unlevel surfaces. Attaches to any LEM grinder. Includes plexi-glass cover. !!!! BACK IN STOCK !!!! Great for mixing meat,vegetables, seasonings or any huge amounts of food. Make your favorite sausage or even your famous seasoning recipe. This product makes clean up and storage so much easier! 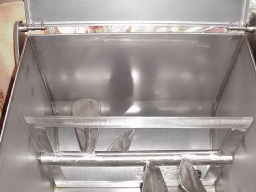 The tub can tilt 90 degrees or 180 degrees to empty or store meat. Meat tub is fully removable just flip up latch. Gearbox is water tight and includes steel roller bearings. 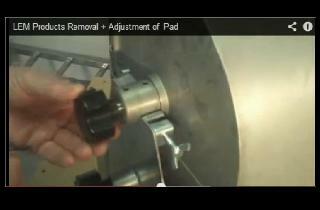 Swivel feet adjust to unlevel surfaces. Attaches to any LEM grinder. 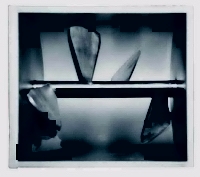 Includes plexi-glass cover.